Room 26 has been learning all about the systems of the human body. To help us with our learning, we participated in workshops from WISE Kid-Netic Energy. 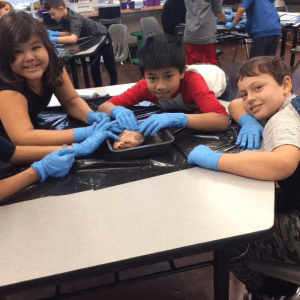 First we learned about our eyes by exploring a sheep’s eye through dissection. It was very interesting and surprising to learn what the inside of an eye looks like. Next, we learned about the heart by examining a pig’s heart and investigating the many different parts. The inside of a heart looks pretty spectacular. It was amazing to learn about the human body in this way!